"BEWARE THE SNEAKY ONE", A Christian Contemplation"
I never planted it myself. It just appeared over the back fence and I welcomed its colorful intrusion. 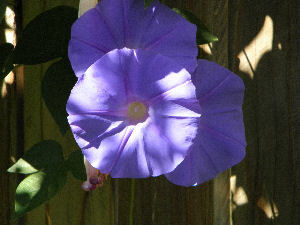 The most beautiful of all the flowers in my garden, it even has a name befitting its attractiveness, "Morning Glory." 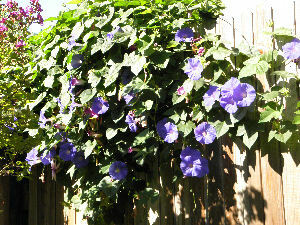 Morning, noon, afternoon and dusk, the vine spread its blue-violet blossoms throughout the garden. So lovely in appearance. The blooms fooled me and I allowed it to grow. It gradually inched its way, tentacle-like vines crawling into the rest of the garden, covering and overtaking everything in its path, up bushes and shrubs, spiraling around the trunk of the tallest tree. On and on it went. Unhindered, nothing could stop the vine's path! It even discovered the tiniest openings in our redwood-slatted fence to continue vigorously into adjoining neighbors'gardens! Angry, we finally attacked the vine. With adrenaline-flowing vigor, we wielded our version of a machete knife. With pruning shears we cut, then untwisted and pulled with determined strength the vine which had gained such a sneaky foothold in our yard! I should have remembered and connected with the warning God spoke through the Apostle Peter when I was first attracted to this beautiful floral enemy's presence. How like the enemy of our soul! "Keep a cool head. Stay alert. The Devil is poised to pounce, and would like nothing better than to catch you napping. Keep your guard up." Like the unruly vine in my well-tended garden, Satan first appeared in the Garden of Eden as a beguiling serpent and deceived Adam and Eve into disobeying God by twisting the truth. That "father of lies" is still with us. Easy to fool others with good looks and sly, underhanded tactics, the wiley one continues today to spread his lies and deceits through individuals, governments and nations, creating chaos and desolation, in his attempt to turn the world from God. The blossoms on the vine itself didn't last. The bright blue flowers began to fade, first into a pale purple/pink, then died-only to have provided temporary beauty throughout the yard, leaving behind dried trailing vines, and spoiling the original design of the garden.